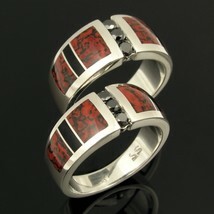 Bold his and hers sterling silver black diamond wedding set inlaid with red dinosaur bone and black onyx. These matching handmade ring bands feature black onyx and dinosaur bone inlay accented by channel set round black diamonds. Each ring is inlaid with 4 pieces of striking red celled dinosaur bone with black matrix. 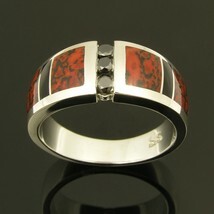 Two narrow sections of black onyx divide up the red dinosaur bone and bring out the black matrix in the gem bone. This Utah dinosaur gem bone came from the Colorado Plateau and was a living animal during the Jurassic Period around 144 to 208 million years ago. His wedding ring has 3 black diamonds totaling .30 carats. The ring is 9.5mm wide and is shown in a size 11. 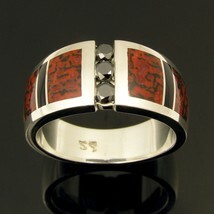 This band will be made to order in your size in 3 to 5 weeks. 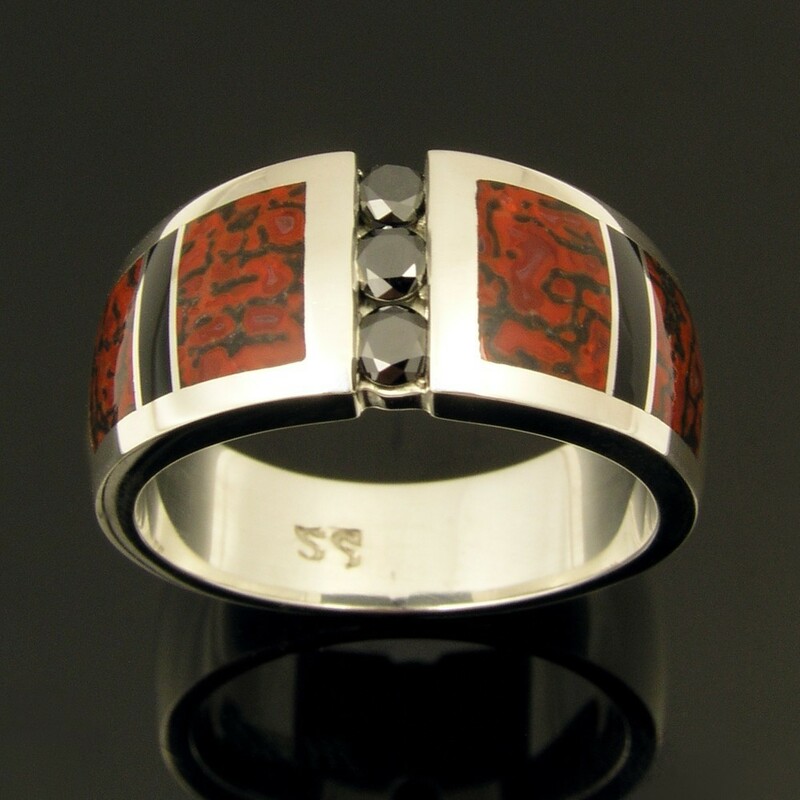 It is hand signed "MMH" by Mark Hileman on the inside of the ring and stamped sterling silver. Individual listing http://www.etsy.com/listing/54620883/mans-black-diamond-sterling-silver Her matching wedding band also has 3 channel set black diamonds which total .18 carats. Her ring is slightly narrower, measuring 8.5mm wide and is shown in a size 7. 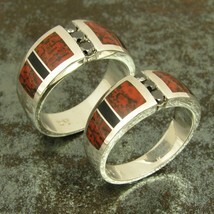 It will be made to order in your ring size in 3 to 5 weeks. The price listed is for the set but the rings are available for purchase separately. Individual listing http://www.etsy.com/listing/54621806/ladies-black-diamond-sterling-silver A black diamond is a genuine diamond that has been enhanced through a radiation treatment to obtain a uniform black color. Just like white diamonds, black diamonds are a 10 on the Moh's hardness scale and make a good stone for everyday wear. The dinosaur bone used in these rings is usually referred to as “gem bone”. It is actually not bone but is a combination of minerals that replaced the bone over time. Dinosaur bone is found in a rainbow of colors with the webbing color and cell size varying greatly from piece to piece. The varying cell size and colors create some truly unique patterns and virtually one of a kind pieces of jewelry. The fossilized dinosaur bone can be composed of many different minerals including agate, jasper and calcite. The dinosaur bone color is determined by the combination of minerals present when the fossilized bone formed.